The first film, On the Buses, was 'shot' between 8th March and 7th April 1971 for a mere £ 90,000. This was then followed by Mutiny on the Buses, in 1972, and the final film, Holiday on the Buses, in 1973. 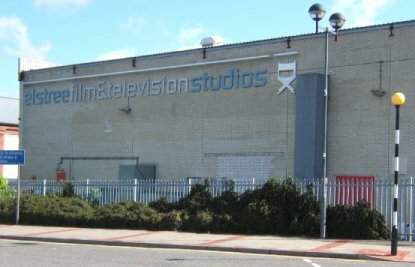 The three films were all made and recorded at the Elstree Film Studios with the location work being very close in the town of Borehamwood, Hertfordshire, the actual home of the studios. 1 The first film On the Buses was such a big hit that it proved to be the most popular film at the box office of 1971 in England! Although a real life bus station (believed to be in Wood Green, London) was used for the exteriors in the television sitcom version of On the Buses, it was Stage 5 at Elstree that was in actual fact used for the exteriors of the bus station in the film versions. The above vid. cap. taken from the film On the Buses, and the aerial shot taken in 1968, both show Stage 5. I personally believe The stages was chosen at the studio for use as a depot on the films as the building, with its concrete area positioned directly in front made, it ideal for doubling as a bus depot. A Tescos supermarket is now situated on the land in question. 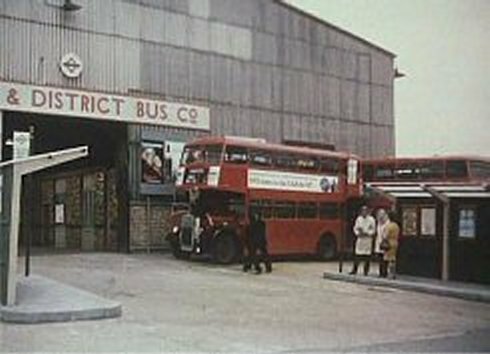 Incidentally Stage 1, which was also demolished in the early 90s, was also used for interior filming for the first of the On the Buses spin-off films. A plaque is displayed on a side wall of the White House cafe building at the front of the studios and near to the security entrance. It hangs next to plaques also displayed by the British Comedy Society. The other plaques pay tribute to the late actor Peter Sellers, and the sitcom spin-off films: Man About The House and Are You Being Served, which were filmed at at the studios in 1974 and 1977 respectively.